February is the month most associated with romance. The reasons are somewhat lost to history but may be due to celebrations for martyred Christian saints with romantic ideals or practices rooted in pagan festivals. Most likely traditions can be attributed to both resulting in our modern Valentine’s Day where expressions of adoration and token gifts are shared by those who live in North America, parts of Europe and Australia. Now, a monastery may not be the first place you think of when you think of romance, but romance lives strongly at Holy Wisdom Monastery in February and throughout the year. Many couples come to the monastery each year to declare their love, exchange their wedding vows and celebrate the beginning of their marriage together. Although each of these beautiful ceremonies differ from one another and uniquely reflect the very special people involved, they all have love, hope and anticipation for the future in common. Weddings are exciting at Holy Wisdom Monastery. They represent the culmination of an average of 10 months of planning that starts when the couple first contacts the monastery to inquire about a date or requests a tour. A planning meeting occurs a few weeks before the wedding and the rehearsal is usually conducted the night before the big day. Wedding coordinators, Amanda Conway and Monica Jefcoat, are resources to the couple throughout the planning process and are on-hand to guide both the rehearsal and the ceremony day. All are welcome to marry at Holy Wisdom Monastery. Weddings are scheduled throughout the year for up to 300 guests and can occur on any day of the week. Most take place in the Assembly Room or on the Lake Lawn overlooking the small glacial lake. When outdoor weddings are scheduled, the Assembly Room is automatically reserved in case of inclement weather making Holy Wisdom an ideal place for an outdoor ceremony. 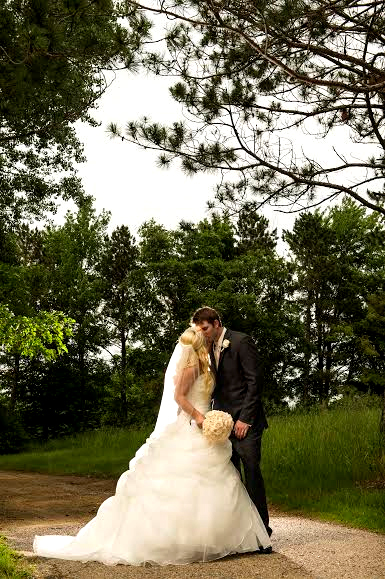 Regardless of the time of year, the monastery grounds provide beautiful backdrops for memorable wedding photos. Rates vary for indoor and outdoor weddings and are based on the time of year. The holiday season through spring vacation time is when a large percentage of engagements occur. If you know a couple looking to wed, please encourage them to tour and consider Holy Wisdom Monastery. To start the process, all couples need to do is complete an inquiry on the Holy Wisdom website. Weddings can be scheduled with just a few weeks’ notice, a couple of years in advance or anywhere in between. Dates are still available for 2018, 2019 and beyond.